It’s what Berkeley sociologist Arlie Russell Hochschild defined in 1979 as “emotion work” — unpaid emotional maintenance that a person undertakes in their private life. Not to be confused, however, with “emotional labor,” another term Hochschild coined, which is essentially paid emotional work — managing feelings and facial expressions to fulfill the emotional requirements of a job. Both terms are in play these days when married white-collar men are unemployed, says Aliya Rao, a postdoctoral fellow at Stanford University who interviewed 25 college-educated, white-collar men and their wives for a study entitled, “The Woman Behind the Man: Unemployed Men, Their Wives and the Emotional Labor of Job-Searching.” Rao found that wives do a significant amount of emotional work at home to get their husbands in the right mindset to demonstrate to potential employers that their killers when it comes to emotional labor. “How are you going to find a job when you have no confidence and are very emotional?” asked Emily Bader, one of the wives Rao interviewed. Emily’s husband Brian had been unemployed for more than a year, and it showed on his face. She thought Brian needed to be confident and upbeat so she would cheerfully proclaim that “any company would be lucky to have him,” all the while fearing his morose demeanor would make employers feel otherwise. Rao explains that wives like Emily are simultaneously doing two kinds of emotion work: “Other-focused emotion work,” i.e., shaping husbands’ emotions into more positive ones; and “self-focused emotion work,” i.e., suppressing concerns and managing their own anxieties for the benefit of husbands during a job search. What did Emily’s emotion work look like? She wouldn’t say this to him — at least not yet. He was still in a wounded, vulnerable stage looking for work and not finding it. So she was reminding him of the good stuff. She told me, “At the same time, it’s killing me inside because I can’t tell him what I think and have to put on this smiley, brave face when that’s not how I feel.” Brian agreed he was feeling down, but Brian didn’t know about the work Emily was doing to mask her real concern. That’s the whole point of emotion work, though: The other person shouldn’t be able to tell that you’re doing it. How did the other wives in your study exhibit emotion work? I found that these wives were doing several things, one of which was trying to make their husbands feel confident. They had lost their job for whatever reason and hadn’t found a new one in at least six months, so they were feeling pretty down and starting to wonder, What’s wrong with me? Wives were reassuring them that they had skills. They often used previous experiences and referenced things previous bosses or other colleagues might have said as proof of their value in the workplace, even though they were worried, too, and maybe doubting their husband’s skills. So even when the wives were cheerleading, they too were worried whether their husbands were going to get a job. How did they manage to do both? By doing both “self-focused emotion work” and “other focused emotion work.” The latter involves wives focusing on how he feels, cheerleading to instill confidence and a sense of professional worth in him. For example, as men were going through the job-search process — sending out a resume, having a phone interview, having an in-person interview, etc. — wives would celebrate each stage: See, you made it to the next phase! They described this as an “incremental” way of measuring progress. That way, if he didn’t get the job, it wouldn’t mean that he wasn’t a valuable candidate or a worthy worker. The “self-focused emotion work” is about suppressing a wife’s own emotions and not allowing her husband to see that she’s concerned because she’s worried how her husband would take that. I had an example of this woman whose husband had been unemployed for a number of years. She talked about how she couldn’t let him see how she was feeling because he would take that so badly that it might derail his job search altogether. So she put on a cheerful normal face so it wouldn’t impact him negatively. How does all of this affect the wives’ psyches? One wife talked about it manifesting in stress eating. Another talked about heightened anxiety and depression. Because they had to suppress these emotions, they were very stressed out because they didn’t have anyone to share with. They were shouldering their husband’s worries and their own. Weren’t some of the wives professionals, too? 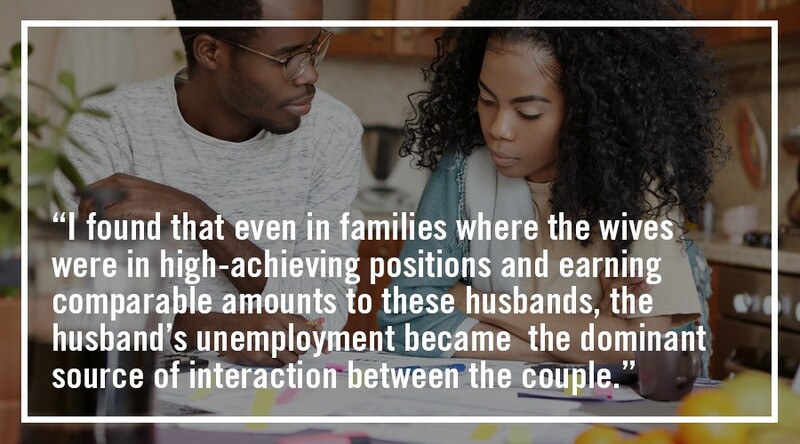 I found that even in families where the wives were in high-achieving positions and earning comparable amounts of money to these husbands, the husband’s unemployment became the dominant source of interaction between the couple. The wives were doing an incredible amount of work just to make the husbands feel good about themselves. They were working super-long hours and taking care of children; they essentially took on a third job managing their husband’s emotions around unemployment and weren’t getting anything in return. They’re doing it not just because they love their husbands — they do — but they really believe how their husbands feel will have an impact on how they go out in job searches and whether they have success in getting an appropriate new position. Is that more or less what “emotional labor” is about? Emotional labor is slightly different. You’re getting paid to use your emotions and facial displays to make other people feel better. It’s commonly seen in the service industry or wherever there are “valued customers”: Waiters and hostesses don’t just serve food; they create an experience of making you feel special. It’s also becoming more important in white-collar workplaces, which is why the white-collar job search isn’t just about skills; it’s about whether your personality fits with a company’s culture. In addition to determining if you have technical expertise, HR managers ask themselves, Is this the kind of person I want on my team? Do I want to go out and have a beer with this person? 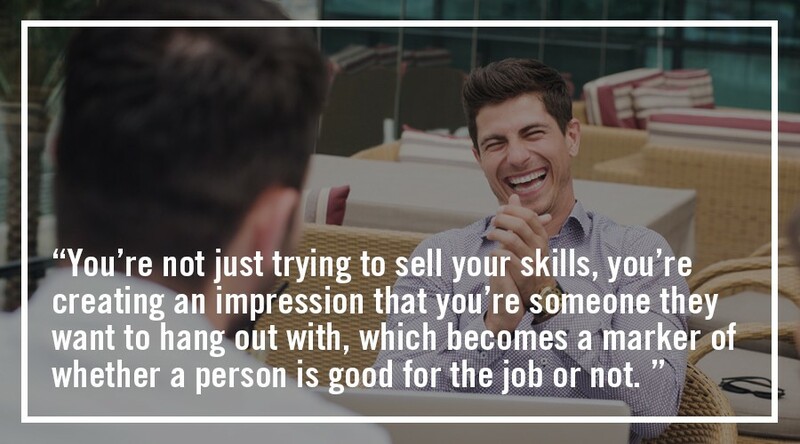 You’re not just trying to sell your skills; you’re creating an impression that you’re someone they want to hang out with, which becomes a marker of whether a person is good for the job or not. Overall, what surprised you most about your study? The comparison to the unemployed women I’ve studied. This phenomenon — an intense focus on the job search — isn’t happening with unemployed women at all. Did husbands also suppress their fears for their wives’ benefit? No. Husbands were open about sharing their concerns like, Maybe I won’t ever find work. So wives were doing emotion work for their husbands, but husbands weren’t doing the same for their wives. Why not? It’s hard to say. There could be several explanations. There’s a huge body of work that suggests husbands don’t do this kind of emotion work. Women are often socialized to be the caregivers and more attuned to other’s feelings and husbands aren’t. Also, the performance of masculinity is one where you’re not supposed to be tuned to others’ emotions. You’re supposed to be a fixer, not a feeler.